Accessory mitral valve tissue (AMVT) is a rare congenital cardiac malformation. It is recognized as a differential diagnosis of left ventricular outflow tract obstruction. Herein, we report a case of AMVT, which was misdiagnosed as hypertrophic obstructive cardiomyopathy. Accessory mitral valve tissue (AMVT) is an uncommon congenital cardiac malformation, and it is frequently diagnosed during the first decade of life, but rarely detected in adulthood(1). This disease is commonly associated with other congenital cardiac anomalies such as ventricular septal defects, patent ductus arteriosus and transposition of the great arteries(1). AMVT may be detected as an incidental finding or, in some cases, may cause left ventricular outflow tract (LVOT) obstruction. Patients with AMVT and significant LVOT obstruction usually present in the early days or years of life with a heart murmur and symptoms of LVOT obstruction such as exercise intolerance, chest pain on exertion, syncope and/or heart failure(2,3). Symptoms usually manifest when the mean gradient across the LVOT is more than 50 mmHg(3-5). Herein, we report a case of a 47 year old man with AMVT, which was misdiagnosed as hypertrophic obstructive cardiomyopathy (HOCM). A 47-year-old male patient was referred to our echocardiography laboratory for the evaluation of hypertrophic obstructive cardiomyopathy. He had well-controlled hypertension. Physical examination revealed a faint, grade 2/6, mid-systolic murmur best heard at the left sternal border and not radiating to the neck. The 1st and 2nd heart sounds were normal, and 3rd or 4th heart sound, gallops or rub was not detected. Electrocardiogram was normal. Transthoracic echocardiography (TTE) revealed normal sized cardiac chambers and mild left ventricular hypertrophy. Interventricular septum thickness was 13 mm, posterior wall thickness 12 mm. Systolic anterior motion (SAM) of mitral valve leaflet was not detected on M mode echocardiography. The mean pressure gradient across the LVOT was 30 mmHg and peak pressure gradient was 50 mmHg. The maximum velocity between the aorta and the left ventricle was detected as 3.4 m/sec, which suggested moderate LVOT obstruction. The left ventricular ejection fraction was 65%. Apical four chamber view revealed a small structure attached to the anterior mitral valve leaflet. Transesophageal echocardiography (TEE) revealed a mobile, hyper-echogenic, membrane like structure moving towards LVOT during systole (Figure 1). The structure was attached to the ventricular side of the anterior mitral valve leaflet as a chordae tendineae like structure, which was meeting the description of an AMVT (Figure 1). This structure was probably misdiagnosed as SAM in previous echocardiographic assessments. 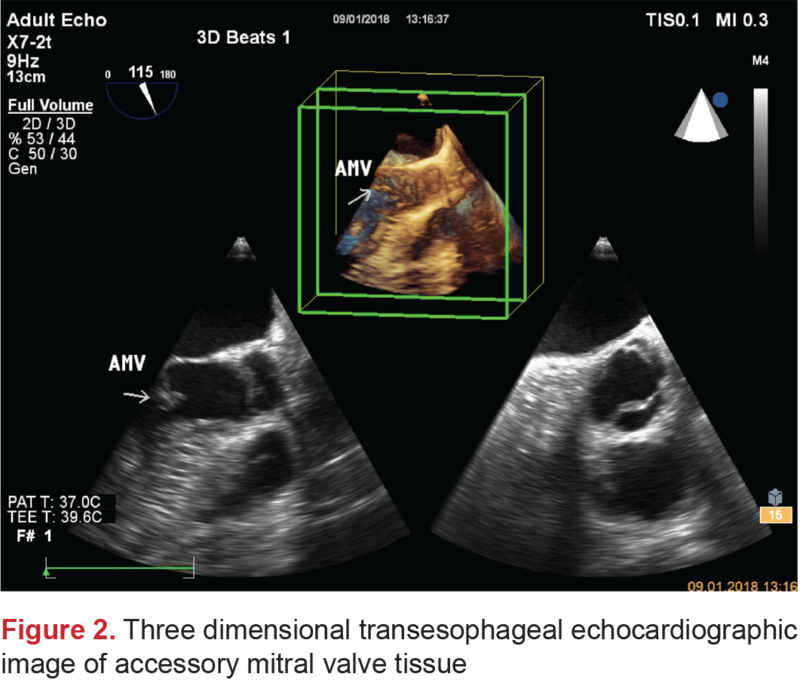 Three dimensional transesophageal echocardiographic examination (TEE) clearly demonstrated AMVT (Figure 2). 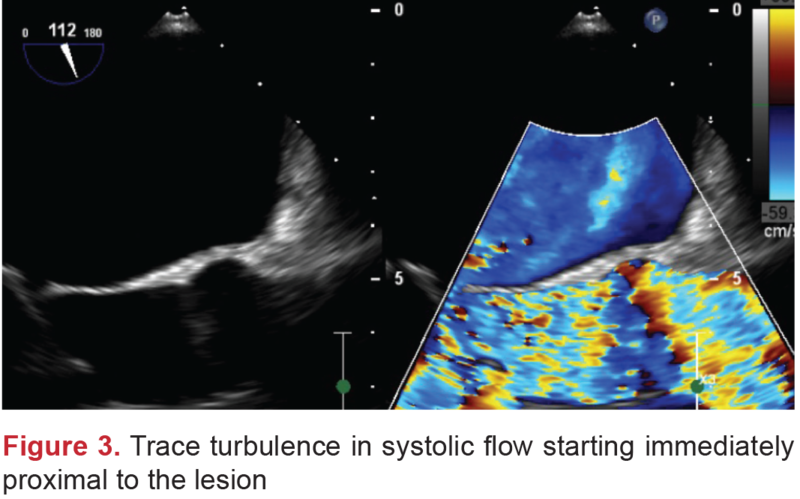 Two dimensional color flow Doppler TEE showed trace turbulence in the systolic flow, starting immediately proximal to the lesion (Figure 3). No other congenital heart anomaly was present. The patient has now been following up with medical treatment and has no symptoms. Informed consent form was obtained from the patient. AMVT is an uncommon anomaly in adults and may be associated with other congenital intracardiac and vascular malformations such as atrial septal defects, atrial septal aneurysms, coronary artery anomalies, persistent left superior vena cava, coarctation of aorta, bicuspid aortic valve, cleft mitral valve and/or dextrocardia(1-6). The estimated incidence of AMVT in adults is about 1: 26.000 echocardiograms(7). It is more frequently identified in men, this entity has a male to female ratio of 1.75(1). The embryologic mechanism of AMVT formation is not clear and may be related to abnormal or incomplete separation of the mitral valve from the endocardial cushions(6,8). 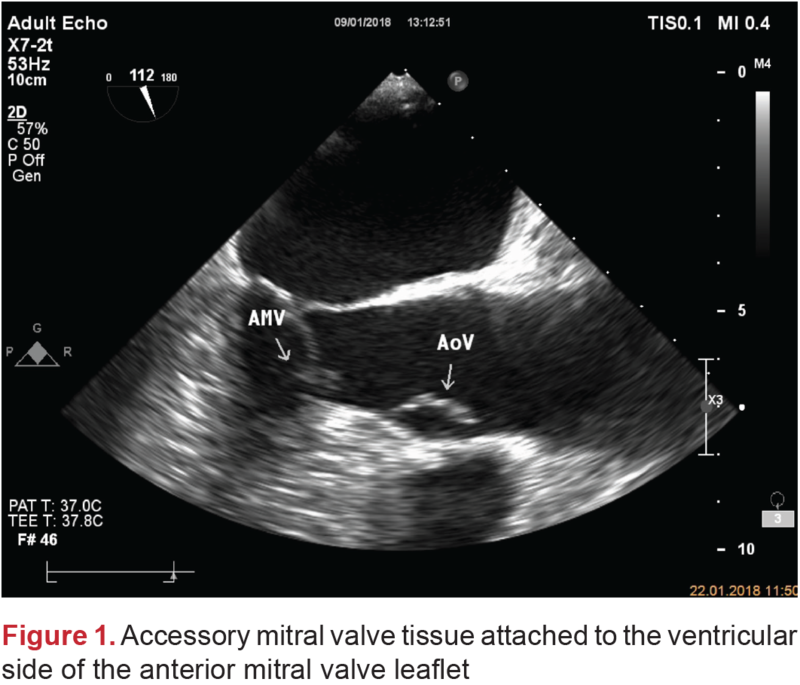 AMVT may affect one or both atrioventricular valves simultaneously but the mitral valve is more often involved(8). Published data show a high prevalence of the mobile type of AMVT, which projects itself into the LVOT, in most cases originating from the anterior mitral valve leaflet, with a higher incidence of parachute like or balloon like structures(6,8,9). Morphologically, AMVT may be classified as type 1 (fixed) or type 2 (mobile)(6). Type 1 presents in two forms: 1A (nodular) and 1B (membranous), and type 2 is divided into two subtypes: 2A (pedunculated) and 2B (leaflet like)(6). The latter corresponds to 46% of cases and may be further subdivided into leaflets with rudimentary chordae and chordae with well-developed tissue(6). According to this classification, our case meets type 2B. Patients with AMVT may be asymptomatic, and it may be an incidental finding during routine echocardiography. However, the patients may usually become symptomatic when the mean gradient across the LVOT reaches 50 mmHg(7,9,10). Both TTE and TEE may help in making the diagnosis, and reveal possible associated lesions and complications. Both 3D TTE and 3D TEE enable more definite anatomic characterization, and allow visualization of the accessory tissue attachment to the interventricular septum or the myocardium, which can help in its classification(6,11,12). 3D TEE provides en face visualization of the mitral valve leaflets from both left ventricular and left atrial aspects. Because it is a rarely seen congenital cardiac malformation, AMVT should be kept in mind in the differential diagnosis of SAM in hypertrophic cardiomyopathy with LVOT obstruction. Informed Consent: Informed consent form was obtained from the patient. Surgical and Medical Practices: D.K., N.T., Concept: N.T., Design: İ.B., Data Collection or Processing: H.C., H.T., Analysis or Interpretation: F.A., Literature Search: D.K., Writing: D.K., N.T., İ.B. Yuan SM, Shinfeld A, Mishaly D, Haizler R, Ghosh P, Raanani E. Accessory mitral valve tissue: a case report and an updated review of literature. J Card Surg 2008;23:769-72. Prifti E, Frati G, Bonacchi M, Vanini V, Chauvaud S. Accessory mitral valve tissue causing left ventricular outflow tract obstruction: case reports and literature review. J Heart Valve Dis. 2001;10:774-8. Prifti E, Bonacchi M, Bartolozzi F, Frati G, Leacche M, Vanini V. Postoperative outcome in patients with accessory mitral valve tissue. Med Sci Monit 2003;9:RA126-33. Ascuitto RJ, Ross-Ascuitto NT, Kopf GS, Kleinman CS, Talner NS. Accessory mitral valve tissue causing left ventricular outflow obstruction (two-dimensional echocardiographic diagnosis and surgical approach). Ann Thorac Surg 1986;42:581-4. Popescu BA, Ghiorghiu I, Apetrei E, Ginghina C. Subaortic stenosis produced by an accessory mitral valve: the role of echocardiography. Echocardiography 2005;22:39-41. Manganaro R, Zito C, Khandheria BK, Cusmà-Piccione M, et al. Accessory mitral valve tissue: an updated review of the literature. Eur Heart J Cardiovasc Imaging 2014;15:489-97. Rovner A, Thanigaraj S, Perez JE. Accessory mitral valve in an adult population: the role of echocardiography in diagnosis and management. J Am Soc Echocardiogr 2005;18:494-8. Yoshimura N, Yamaguchi M, Oshima Y, et al. Clinical and pathological features of accessory valve tissue. Ann Thorac Surg 2000;69:1205-8. Panduranga P, Eapen T, Al-Maskari S, Al-Farqani A. Accessory mitral valve tissue causing severe left ventricular outflow tract obstruction in a post-Senning patient with transposition of the great arteries. Heart Int 2011;6:e6. Mizuno A, Koike Y, Niwa K. Four-dimensional visualization of accessory mitral valve tissue and cleft mitral valve movement. Echocardiography 2013;30:E114-5. D’Aloia A, Vizzardi E, Chiari E, et al. Dynamic mild subaortic left ventricular obstruction caused by an accessory mitral valve attached to the anterior mitral valve in a young pregnant woman. Eur J Echocardiogr 2008;9:160-1.